Peru is currently one of the South American countries that work the hardest to pursue the automation of its electoral system. 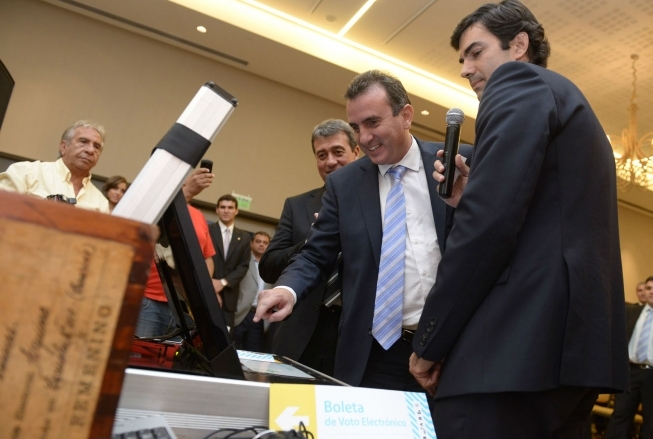 Years of technology searching, a national referendum, and technical tests have made it possible to deploy an e-voting platform tailor-made for the South American nation. The automated system designed by the National Office for Electoral Processes has only been used in three electoral processes so far. However, there will be a new attempt this Sunday, this time in the country’s capital, Lima. The district of Santa María del Mar will elect the 22 province aldermen that were revoked last March on an election where e-voting was used. 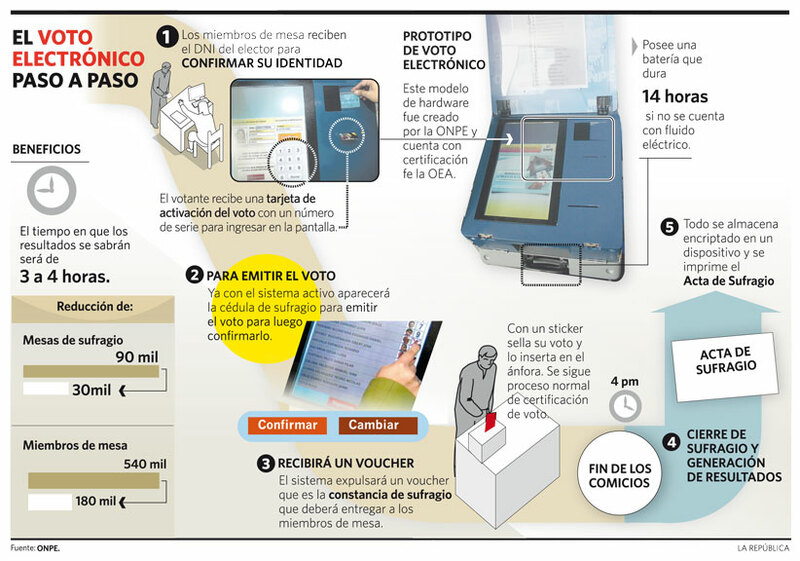 Peru’s automated suffrage is based on the use of a card that activates the options (candidates) to vote for when introduced in the voting machine. Voters press their desired selection, the system processes and saves the vote, and finally, the process is closed with the emission of a paper receipt that shows the selection. This receipt is inserted in a box as a physical evidence of the electronic registry. Results are transmitted via satellite to a data center. For the sake of completeness, a drill where all the logistic and technical stages were tested took place some days ago, with optimum results. Arturo Revoredo, Junior Organization Manager at ONPE, stated that the technology and organization used in the district of Pacarán (Cañete) were implemented. This is the only province with experience in automation until now. He indicated that “e-voting will be implemented gradually and progressively in order to generate trust from both the voters and political organizations, the same way it was done in Pacarán.” Next stage consists in deploying the technology 10 districts in Lima during the 2014 elections. Peru’s strategy is not to be daunted by the barrier set by the Executive Power not assigning the necessary resources to produce the equipment that would make it possible to automate elections in more circuits, and also to guarantee the information campaign for voters and the training program for the electoral staff. ONPE has made an effort to continue deploying its technology, and next Sunday’s elections will show the authorities again that it is up to them that the nation stops chasing the goal to focus on the implementation of the system that will give real guarantees to voters and Democracy. In less than three months, Colombia will take a decisive step towards automation by carrying out a pilot test whose purpose is to bring up the possibilities technology provides to facilitate the execution of safe, fast, and transparent elections. The E-voting Advisory Commission has worked nonstop to outline the path the nation will follow towards the selection of a model that represents the advantages of automation and adapts to the legal requirements and characteristics of Colombian suffrage. To this end, an international tender call was made, which was attended by 16 companies specializing in offering the two types of technology that Colombia wants to test out. One of them is called PCOS (Precinct Count Optical Scan), which is based on the use of a ballot box with a scanner that identifies ballots and processes votes in order to count them automatically. The second option is the Direct Recording Electronic (DRE) system, which consists in the use of touchscreen machines that enable voting, vote storage, and their tallying and transmission to a data center. These devices must also have the capacity to emit physical receipts of the selections made by the voters. Based on this requirement, more than a dozen companies from Colombia and abroad signed up to be elegible to deploy their technology on January 31st, 2014 in the 93 electoral constituencies from the 30 provinces chosen to star on the e-voting pilot test. Starting now, the Registrar’s Office will be in charge of studying the financial proposal that was requested from the companies and evaluating which of them meet the requirements, which range from adapting the technology and machines to rural areas that can present connectivity problems and blackouts and having mechanisms to facilitate voting to citizens with disabilities, to generating software that enables the scrutiny, tallying, and transmission of results, electoral data encryption, and auditability of all the stages of the process. The task Colombia is undertaking could free the country from long and tense discussions, as the performance of the chosen technologies will allow discerning what system the nation needs for the future. The decision made is to end the delay in presenting election results, which damages the credibility of authorities and institutions, and also to stop the occurrence of fraud such as double voting, which has marred the elections for decades. Last October, two elections took place in Salta, Argentina: the primary, open, simultaneous, mandatory elections (PASO) that were held on October 6th and were automated, which determined the candidates for national posts; and on the 27th, legislative elections were carried out manually. What happened? On October 6th, the elections were held with much announced e-voting logistics, and 60% of the voting registry attended the call. On the other side, 73% of the electoral registry voted during the manual election on October 27th. For some, this is a clear indicator that Salta has been a bad experiment in terms of e-voting implementation. The National Senate for Salta, Sonia Escudero, explained that one of the deficiencies of the electronic voting system is that it is not adapted to the social reality of the locale. She states that, in order to vote with this specific kind of machines, one must be familiar with the use of computers. Province Deputy for the Saltan Front Javier David alerted the Electoral Court about the lack of training of the electorate and denounced the poor performance of the voting equipment the very day of the election. In addition to these difficulties, the lack of experience from the provider became evident in the deficient technical training of the machine operators, who were not able to tackle contingencies the best way. Deputy David argued so by stating that when the machines stopped working and had to be replaced, the polling station authorities had no way to be sure that the malfunction didn’t affect or alter previously marked ballots in the machine. In this respect, Teresa Ovejero, Secretary of the Salta Electoral Court, admitted to the lack of training not only of the citizens, but also of the technicians accompanying the session. She pointed out that the instructors themselves “informed that very few people attended the training sessions on Friday afternoon and all Saturday long.” The officer put part of the blame on Magic Software, the technology provider. The main consequence of these events is the unfortunate appreciation of manual voting as an ideal suffrage method in times when electoral commissions around the world do not hesitate to implement some sort of technology in their processes. In light of this setback, the problem is not caused by the people of Salta, but by a deficient technology that was incorrectly applied. One of the guarantees that must be provided by a technology provider during an election is mainly the overcoming of problems typical of manual voting, such as delays and long lines. Besides, e-voting must offer speed, reliability, and veracity, among other benefits. In fact, there are positive examples in the region, such as Brazil and Venezuela, both of which had participation rates of up to 80% during their past presidential elections.